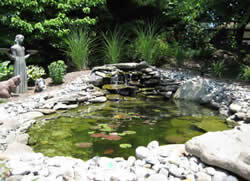 "I asked BMS Lawn & Landscape to design a pond around a statue I had bought. I provided a few ideas of my own in a rambling and disjointed fashion. When the pond was completed, I was thrilled that my ramblings had actually been understood and embellished on by Chris. He stayed within the agreed-upon price and was determined all aspects of the pond were to my satisfaction. Any question I had was answered until I understood it. I now have 14 fish. Thanks Chris!!" "Chris has been very reliable in providing service over the years. He is here when he says he will be here. His crew leaves the lawn and its edges trimmed and neat. Chris is always available to offer advice and assistance to help any homeowner with a lawn or yard issue. Over and above that, he's just a nice, friendly young man to do business with." "I started using BMS Lawn & Landscape 10 years ago and have been completely satisfied ever since. Chris and his staff are friendly and professional. They do beautiful work at excellent prices. I would recommend BMS to anyone without hesitation." "I have had my townhouse landscaping needs serviced by Chris Bull of BMS Lawn & Landscape for at least the last few years. His work and professionalism is top notch. Chris always responds to my calls promptly, although I have not had to call him very often. All maintenance is done automatically. There is very little for me to do, which is the way I prefer things. I would not hesitate to recommend BMS for lawn maintenance, pruning, edging and mulching, etc."